Fatigue is a disabling, multifaceted symptom that is highly prevalent and stubbornly persistent. Although fatigue is a frequent complaint among patients with fibromyalgia, it has not received the same attention as pain. Reasons for this include lack of standardized nomenclature to communicate about fatigue, lack of evidence-based guidelines for fatigue assessment, and a deficiency in effective treatment strategies. Fatigue does not occur in isolation; rather, it is present concurrently in varying severity with other fibromyalgia symptoms such as chronic widespread pain, unrefreshing sleep, anxiety, depression, cognitive difficulties, and so on. Survey-based and preliminary mechanistic studies indicate that multiple symptoms feed into fatigue and it may be associated with a variety of physiological mechanisms. Therefore, fatigue assessment in clinical and research settings must consider this multi-dimensionality. While no clinical trial to date has specifically targeted fatigue, randomized controlled trials, systematic reviews, and meta-analyses indicate that treatment modalities studied in the context of other fibromyalgia symptoms could also improve fatigue. The Outcome Measures in Rheumatology (OMERACT) Fibromyalgia Working Group and the Patient Reported Outcomes Measurement Information System (PROMIS) have been instrumental in propelling the study of fatigue in fibromyalgia to the forefront. The ongoing efforts by PROMIS to develop a brief fibromyalgia-specific fatigue measure for use in clinical and research settings will help define fatigue, allow for better assessment, and advance our understanding of fatigue. Fibromyalgia is a chronic, multi-symptom complex with no effective treatment. It affects 2% of the United States population and significantly impacts both healthcare costs and utilization of healthcare resources [1, 2]. In addition to unrefreshing sleep, cognitive difficulties and affective symptoms, chronic widespread pain and fatigue are its cardinal symptoms [3, 4]. For patients with fibromyalgia and their treating clinicians, fatigue is a complicated, multifactorial, and vexing symptom that is highly prevalent (76%) and stubbornly persistent, as evidenced by longitudinal studies over 5 years [5–7]. Despite its disabling effects, fatigue has not received the same research attention in fibromyalgia as has pain, for a variety of reasons. First, there is no established nomenclature with which to describe the multiple types and manifestations of fatigue. Patients with fibromyalgia may experience fatigue physically (lack of energy, physical exhaustion), emotionally (lack of motivation), cognitively (inability to think or concentrate), or via the symptom’s impact on virtually any aspect of living, such as the ability to work, meet family needs, or engage in social activities . Patients may experience these different types of fatigue simultaneously, but clinicians rarely sort this through during the typical office visit, and the complaint is often chronicled simply as 'fatigue’. Second, clinical experience indicates that patients usually do not feel comfortable making an appointment for 'just’ fatigue. They need a medical condition or an acceptable symptom (as institutionally and culturally dictated), such as pain, despite the fact that fatigue is reported as a bothersome symptom in up to 80% of patients with chronic conditions and is a common complaint in both primary and specialty clinics [9–11]. Third, the lack of understanding of the mechanisms of fatigue contributes to poor assessment and treatment strategies, and may make providers wary of broaching the topic in a clinical encounter. Fortunately, two recent initiatives, the Outcome Measures in Rheumatology (OMERACT) [12–15] and the Patient Reported Outcomes Measurement Information System (PROMIS) , are helping to move the study of fatigue in fibromyalgia forward. OMERACT organized focus groups and Delphi studies of both patients with fibromyalgia and physician experts that have resulted in important recommendations for assessment and treatment of fatigue. First among these was the ranking of fatigue, pain, sleep, quality of life, mood, and cognition as the most relevant symptoms in fibromyalgia, and second, the recommendation that fatigue be assessed in all clinical trials of fibromyalgia. PROMIS, an initiative of the National Institutes of Health, developed item response theory-based banks to assess symptoms such as fatigue, pain, and sleep, as well as quality of life measures. The goal of this initiative was to 1) create measures that are valid, reliable, and generalizable for clinical outcomes that are important to patients, 2) reliably assess patient response to interventions, and 3) inform treatment modifications. The PROMIS Fatigue Item Bank (PROMIS-FIB) contains 95 items that evaluate the spectrum of fatigue from mild subjective feelings of tiredness to an overwhelming, debilitating, and sustained sense of exhaustion that interferes with activities of daily living, family, and social roles . The assessment categories are divided into the experience (frequency, duration, and intensity) and impact of fatigue on physical, mental, and social activities. Work is currently underway to assess the psychometric properties of the PROMIS-FIB and develop a brief fibromyalgia-specific measure for clinical and research purposes. 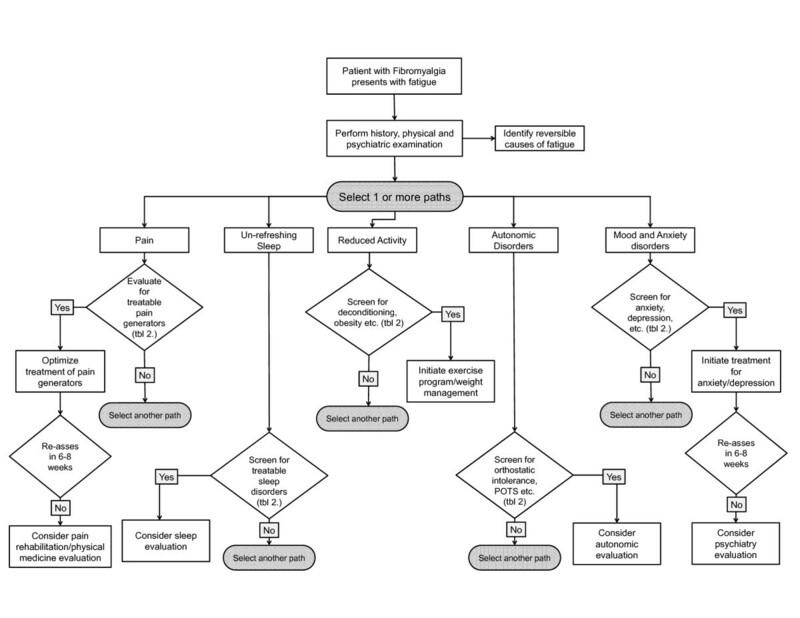 The objectives of this narrative review are to 1) provide a general overview of the current knowledge of fatigue in the context of fibromyalgia, 2) suggest a rationale for assessment of fatigue, and 3) describe non-pharmacological and pharmacological management modalities studied in the context of fibromyalgia that also improve fatigue. While this is not a systematic review, this critical narrative review may guide clinical decisions when faced with a fatigued patient with fibromyalgia. The search was performed using Ovid MEDLINE, Ovid EMBASE, and EBSCO CINAHL (Cumulative Index of Nursing and Allied Health Literature), covering 2000 through May 2013. The search strategy used controlled vocabulary (subject headings) and text words in the title and/or abstract - fibromyalgia, fatigue and synonyms related to fatigue (for example, weakness, tiredness, exhaustion, stiffness, depression). The results were limited to English, publication format (review, meeting abstract) and study designs (trials, cohort studies, systematic reviews), yielding a total of 644 unique publications. Results of qualitative studies provide insights into the encumbrance that fatigue inflicts on patients with fibromyalgia and the concomitant problem of articulating to their doctors what is wrong. Patients with fibromyalgia describe fatigue as 'an inescapable or overwhelming feeling of profound physical tiredness’, 'weakness in the muscles’, 'an uncontrollable, unpredictable constant state of never being rested’, 'a ghastly sensation of being totally drained of every fiber of energy’, 'not proportional to effort exerted’, 'not relieved by rest’, 'having to do things more slowly’, and 'an invisible foe that creeps upon them unannounced and without warning’ [8, 18, 19]. Patients also report that fatigue is interwoven, influenced, and intensified by pain, and is sometimes more severe than pain . Although fatigue is reported by both men and women with fibromyalgia, one study demonstrated that men had less fatigue compared to women and a second study reported that men tend to focus more on pain and women on fatigue [8, 20]. The key symptoms of fibromyalgia - pain, fatigue, unrefreshing sleep, dyscognition, and depressed mood - do not occur in isolation. Rather, they often present concurrently, in varying severity, and are intertwined with and influence each other (Figure 1). Indeed, studies demonstrate that chronic persistent pain (both from abnormal central sensitization and maintenance of nociceptive pain from peripheral pain generators), poor sleep quality (subjective report and objective measures), depressed mood, anxiety, or combinations of these are associated with fatigue [21–23] (Table 1). In addition to common fibromyalgia symptoms, clinical characteristics (for example, body mass index), health behaviors (for example, physical activity levels), and psychological variables (for example, negative affect, catastrophizing, affect regulation), also demonstrate strong associations with fatigue [22–27] (Table 1). In addition to cross-sectional associations, diurnal rhythmicity and lag relationships have also been demonstrated between fatigue and other fibromyalgia symptoms (particularly pain, stiffness, and affect), suggesting that one variable can influence or predict the others [28, 29]. Appreciating these associations is important in fatigue assessment because daily assessment of fatigue may uncover lag relationships with other symptoms, providing avenues for intervention. Collectively, these studies indicate that many symptoms feed into fatigue and the implication of this finding, for both clinical practice and research, is that fatigue assessment must consider this multi-dimensionality. This is not unlike pain in fibromyalgia, which is increasingly demonstrated to be multidimensional, with contributions from central pain, peripheral musculoskeletal pain generators, and neuropathic pain, among other pathways . Association of fatigue and other fibromyalgia symptoms. The association of objective tests assessing the hypothalamic-pituitary-adrenal axis, hypothalamic-pituitary-gonadal axis, and corticotropin releasing factor in the cerebrospinal fluid with fatigue have been negative or inconclusive [38, 45, 46]. However, preliminary studies indicate that histological characteristics of skeletal muscle, such as muscle fiber distribution and capillary density, may be correlated with post-exertional malaise . More recently, genomic studies have sought to identify possible physiologic pathways to explain the symptoms experienced by patients with fibromyalgia. Gene expression studies suggest the significant role of the catechol-O-methyltransferase, cytokine, adrenergic, dopamine, glucocorticoid and mineralocorticoid receptors, iron channel receptors and serotonin transporter in developing and maintaining the symptom complex [48, 49]. However, most of the early studies were conducted using pre-selected gene single nucleotide polymorphisms, which may introduce selection bias in assuming the disease etiology of fibromyalgia. One recent study investigating whole genome expression in patients with fibromyalgia with fatigue found an upregulation of centromere protein K (CENPK) and heat shock protein 90 kDa alpha (cytosolic, class A member 1 (HSP90AA1)) genes in fibromyalgia subjects when compared with age-, gender-, and race-matched healthy controls . These genes are associated with glucocorticoid receptor signaling and the protein ubiquitination pathway (GIN1, GRAMD1C, ZNF880, NFYB, CENPK, CA1, and TNS1) . Impairment of the ubiquitination pathways has been demonstrated to be associated with neurodegenerative diseases (for example, Alzheimer’s and Parkinson’s disease) and depression . Additionally, interferon signaling and interferon regulatory pathways (associated with spinal nociception) distinguished between the pain groups, and dendritic cell maturation (associated with mood) delineated between the catastrophizing groups . Collectively, these studies suggest that multiple physiological mechanisms may be associated with the symptom of fatigue. In the absence of objective biomarkers, assessment of fatigue is guided solely by patient-reported symptoms. Presently, there are no algorithms with which to systematically assess and treat fatigue. As noted, assessment must consider fatigue’s multidimensional manifestations. In clinical practice, therefore, evaluation of fatigue must account for both the experience of fatigue, as well as its functional impact, and place these in the context of other symptoms and co-morbidities specific to the particular patient. The assessment begins with a thorough history and physical examination (to identify reversible causes of fatigue), and a systematic symptom-centered assessment pertaining not only to fatigue but also to pain, sleep, autonomic symptoms, causes of unrefreshing sleep (for example, obstructive sleep apnea, restless leg syndrome), psychiatric disorders, such as depression and anxiety, and inquiry into health behaviors, daily practices, such as physical activity, and dietary habits (Figure 2). Table 2 illustrates common fibromyalgia symptoms, sample assessment tools, conditions to consider and suggestions for objective tests to evaluate abnormal symptoms. A sample systematic symptom-centered assessment of fatigue. POTS, postural orthostatic tachycardia syndrome; tbl 2, Table 2. ASP-31, Autonomic Symptom Profile-31; BPI, Brief Pain Inventory; CES-D, Center for Epidemiologic Studies Depression Scale; GAD-7, Generalized Anxiety Disorder questionnaire; HADS, Hospital Anxiety and Depression Scale; MFI, Multidimensional Fatigue Inventory; MOS-Sleep, Medical Outcomes Study Sleep Scale; PHQ-9, Patient Health Questionnaire; SF-36, Medical Outcomes Study Short Form-36; VAS, Visual Analogue Scale. In the research setting, in the absence of an objective measure, fatigue in fibromyalgia can only be assessed with validated, self-report questionnaires. Although the OMERACT Fibromyalgia Working Group recommends the assessment of fatigue in all clinical trials of fibromyalgia, no measure specific to fibromyalgia fatigue has been developed to date . 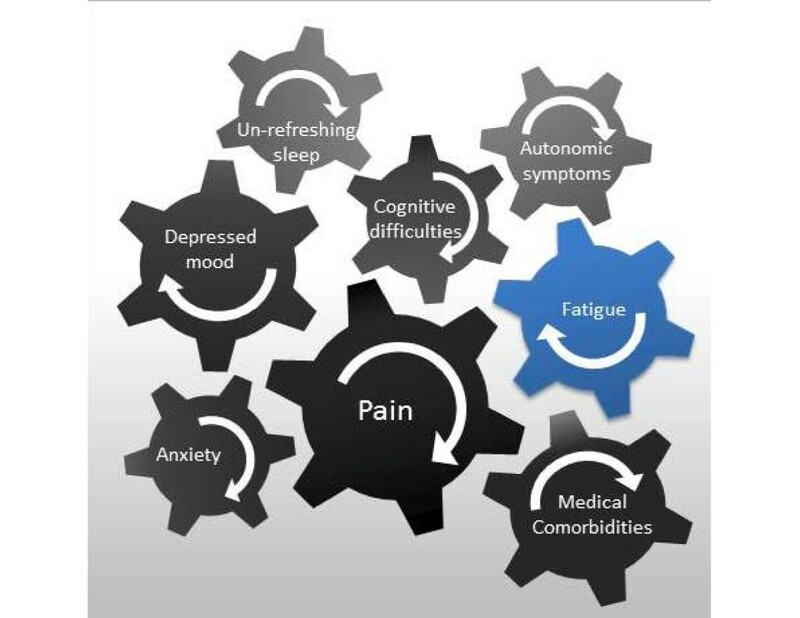 Fatigue assessment in clinical trials has utilized single item measures (visual analog scale - fatigue), multidimensional fatigue measures (for example, Multidimensional Fatigue Inventory and Multidimensional Assessment of Fatigue), or single items from composite measures, such as the Fibromyalgia Impact Questionnaire - Revised and the Medical Outcomes Study Short Form-36 [54, 55, 63–66] (Table 3). Notably, most of these questionnaires were created for the assessment of fatigue in other chronic disorders such as cancer and rheumatologic conditions and have yet to be validated for fibromyalgia, with the exception of the single-item fatigue visual analog scale . Debate also remains concerning the aspects of fatigue that must be assessed and whether measurement of fatigue requires subsets of questions targeting its separate manifestations (for example, global, somatic, affective, cognitive, and behavioral). Ongoing work from PROMIS and other groups will bring clarity to these issues. Until then, when selecting a fatigue questionnaire, researchers must consider its purpose. If the questionnaire is to be used as a screening tool, a shorter, single-item measure may be appropriate, or if the need is to evaluate an intervention, a multidimensional scale may be more appropriate. Our current understanding of the pathophysiology of fatigue suggests that its management in patients with fibromyalgia is most successful if developed by a multidisciplinary team with the patient as an equal participant. The treatment program should be individualized, and likely will incorporate combinations of behavioral, pharmacological, and rehabilitative interventions. Management is not aimed at the etiology of fatigue; rather, the focus is on symptoms, contributing factors, and treatment of comorbidities. Clinical experience suggests that a step-wise approach integrating different modalities with periodic assessment is ideal. This approach should be continued until clinically meaningful symptom improvement is achieved. Care should always begin with patient education on the nature of fatigue and fibromyalgia, setting pragmatic goals for symptom reduction, and improvement of function. Patient education can include strategies such as pacing, energy conservation, increasing lifestyle physical activity, getting regular exercise, rest-activity balance, balanced diet, lifestyle moderation, stress management, time management, and sleep hygiene. As previously mentioned, daily symptom logs can help identify activities that exacerbate fatigue and other fibromyalgia symptoms. They can also guide individualization of non-pharmacological modalities. A selected listing of pharmacological and non-pharmacological clinical trials conducted in fibromyalgia where fatigue was also assessed is given in Tables 4, 5 and 6. In all of these studies, fatigue was only assessed as a secondary outcome (pain was primary). Even so, clinically meaningful changes in fatigue were demonstrated in some of these efficacy studies. This indicates that treatment modalities studied in the context of fibromyalgia could also be utilized to improve fatigue. aMultidisciplinary treatments varied between studies but typically included education, exercise, psychotherapy (that is, cognitive behavioral therapy (CBT), dialectical behavior therapy (DBT), and so on), and occupational and physical therapies. CF, chronic fatigue; CFIDS, chronic fatigue and immune dysfunction syndrome; FIQ, Fibromyalgia Impact Questionnaire; FM, fibromyalgia; MCID, minimal clinically important difference; OA, osteoarthritis; RA, rheumatoid arthritis; RCT, randomized controlled trial; VAS, Visual Analogue Scale. FIQ, Fibromyalgia Impact Questionnaire; FM, fibromyalgia; MAF, Multidimensional Assessment of Fatigue; MFI, Multidimensional Fatigue Inventory; RCT, randomized controlled trial; VAS, Visual Analogue Scale. BFI, Brief Fatigue Inventory; CBT, cognitive behavioral therapy; CFS, chronic fatigue syndrome; FIQ, Fibromyalgia Impact Questionnaire; FM, fibromyalgia; MAF, Multidimensional Assessment of Fatigue; MCID, minimal clinically important difference; RCT, randomized controlled trial; SF-36, Medical Outcomes Study Short Form-36; TENS, transcutaneous electrical nerve stimulation; VAS, Visual Analogue Scale. Non-pharmacological symptom management modalities, such as graded aerobic exercise, have demonstrated beneficial effects on physical capacity and fibromyalgia symptoms, including fatigue [73, 74] (Table 4). Combining aerobic exercise with resistance and strength training may offer additional benefits [146, 147]. Cognitive behavioral-based therapies (particularly for comorbid depression, anxiety, and pain), meditative movement therapies (for example, tai chi, yoga, qigong) and education sessions led by occupational therapists to enable patients to identify individual lifestyle factors that exacerbate fatigue and develop appropriate fatigue management and energy conservation techniques have good efficacy data [51, 148–150]. As with medications that require an adequate dose and duration for clinical efficacy, non-pharmacological modalities will only be effective if they are adequately dosed over the period of time that is required for physical, cognitive, and psychological rehabilitation. In most cases this may require several months and a step-wise, graded approach. Patients should be educated upfront to optimize success and compliance with the management strategy. Complementary and alternative therapies, such as acupuncture and homeopathy, have not demonstrated benefit in clinical studies, although patients commonly utilize these modalities, citing clinical benefit . Carefully designed future trials will shed light on their use. Trials of serotonin-norepinephrine reuptake inhibitors, selective serotonin reuptake inhibitors, tricyclics, and alpha-2 delta ligands that impact multiple fibromyalgia symptoms suggest that these medications could also improve the symptom of fatigue (Tables 5 and 6). The choice of medication depends on the patient’s comorbid symptoms and use of a single medication to address multiple symptoms may be beneficial to minimize side effects. For example, in a fatigued patient with fibromyalgia with comorbid depression, serotonin-norepinephrine reuptake inhibitors, selective serotonin reuptake inhibitors, or tricyclics that have a differential effect on mood may be the pharmacological agent of choice. On the other hand, an alpha-2-delta ligand or a tricyclic may be more appropriate for a patient with comorbid unrefreshing sleep. If insomnia and unrefreshing sleep are the most bothersome symptoms for the patient, then targeting this symptom domain alone may improve both sleep and fatigue. Central nervous system stimulants may be most appropriate for patients with fatigue and comorbid narcolepsy. Though this class of medications is widely adopted in clinical practices to help patients with function, there are not enough data to support this practice [52, 123, 152]. Despite the demonstrated efficacy of some of these pharmacological agents, the clinician should be mindful that not all patients with fibromyalgia can tolerate medications. Medication sensitivity and medication intolerance is a major patient concern. Judicious use of lower doses of medication with frequent assessment for efficacy and side effects may help some patients . Botanicals, such as ginseng, and dietary supplements, such as coenzyme Q10, s-adenosyl methionine and acetyl-l-carnitine, have been posited to relieve fatigue [120, 140, 144, 145] (Table 6). Although these agents are largely devoid of the side effect profile of pharmacologic agents, only preliminary efficacy data are available. Fatigue is a complex symptom that is differentially experienced by individual patients with fibromyalgia depending on their genetic, biological, and psychosocial makeup, self-efficacy and emotional regulatory capacity, and presence of comorbidities. The profile of fatigue in fibromyalgia is similar to that in many chronic conditions, although the presence of fibromyalgia with other rheumatological conditions seems to intensify fatigue [154, 155]. A commonly observed theme in the literature is the co-occurrence of fatigue with other centrally mediated symptoms such as pain, unrefreshing sleep, affective symptoms, and the influence of psychosocial variables. This may imply that the same central mechanisms that drive pain, mood, and sleep also drive fatigue. Given that these symptoms (for example, pain, fatigue, sleep) occur concurrently, we tend to assume that they manifest at the same level. This may not be an accurate way to view fatigue. It may be that fatigue is a higher order construct, or meta-construct that is fed by other, more discrete symptoms. Only further inquiry will address these questions. At the clinical level, given our current limitations, fatigue management is best facilitated by conducting a nuanced fatigue assessment in routine clinical encounters to include a thoughtful history and investigation for treatable causes of fatigue, and screening for fatigue and other common comorbid fibromyalgia symptoms such as pain, anxiety, depression, sleep, and stress. Fatigue assessment and management can also be enhanced by encouraging patients to keep symptom logs to gain insights into lag relationships among symptoms, educating patients about the nature of fatigue, and setting realistic goals for symptom management (that is, focus on decreasing the impact of symptoms and improve function rather than symptom alleviation alone). From a research perspective, a disease-specific fatigue measure for fibromyalgia is needed to move the field forward. Additionally, studies to understand mechanisms (for example, biological, physiological, or psychological) and management of fatigue are also needed. As the study of fatigue in fibromyalgia advances, multidisciplinary collaborations that are patient-centered and facilitate patient engagement will guide treatment options to provide relief. This study was supported in part by the Center for Translational Science Activities (CTSA) at Mayo Clinic. This center is funded in part by a grant from the National Center for Research Resources (NCRR), a component of the National Institutes of Health (NIH) (RR024150). Its contents are solely the responsibility of the authors and do not necessarily represent the official view of CTSA, NCRR, or NIH.